Sorry for the late episode this month, but your intrepid host and producer Samuel Hansen had to go and get himself concussed at his day job. This means he was not able to put together the episode he was planning on releasing, not to worry though he has some tricks up his sleeve. As you may know March 2017 is the month of #TryPod, where podcasts from all over are banding together to convince their listeners to help raise awareness of podcasts by suggesting podcasts to friends and family they may like. 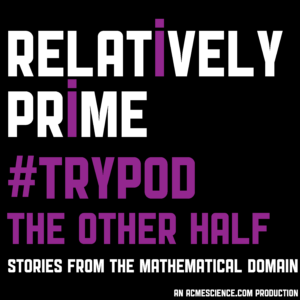 This meant that while Samuel was unable to put together a show himself this month he figured why not do a #TryPod for all his listeners and feature an episode of one of his favorite mathematical podcasts The Other Half(To be fully above board Samuel is the Executive Producer and Editor of The Other Half, but all of the genius of the show is fully down to the knowledge and skills and the two amazing hosts Anna Haensch and Annie Rorem).